Happy Friday guys! I don't know about you but I'm so happy its finally the ned of the week! This week has been CRAZY! I'll be leaving for AZ next week so I've been getting things squared away at work, cleaning, and packing! On that note about packing, I am teaming up with Vegas.com on today's post to share everything you need for a fabulous weekend getaway! There's always something going on in Las Vegas and you can make the trip anything you want! Check out my checklist and and a breakdown of what I packed below - best part about this all you need is a carry on and you'll be on your way! If you're heading there anytime soon or want to get a trip planned you can view all the hotel deals on the Vegas.com hotel page! They also have tons of information on what you can do and visit while you're there! Let's jump into it! You want to be comfy and stylish during the day so I brought pieces I could re-use for other days and that I would be comfortable and cool in all day long. 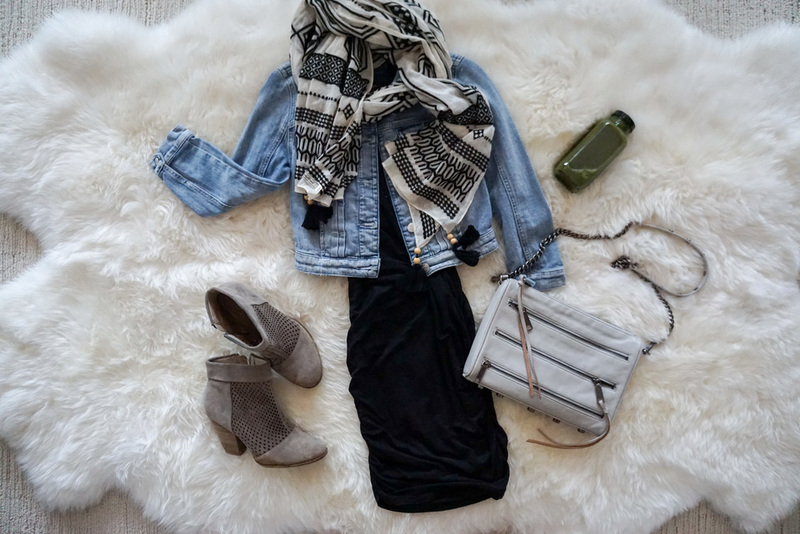 First things first I ALWAYS pack a scarf with me no matter where I go and this fun printed one is a great piece to keep you warm but also accessorize a basic dress during the day! This day dress is the perfect material whether its cool or warm in Vegas. This is perfect for walking around on the strip and just hanging out! I also paired mine with these booties that were also perfect for walking up and down the strip. You want to make sure your shoes are comfortable because there is a TON of walking! I wore these one day and also had a pair of gym shoes that worked great too! You want to have a good bag with you - for me I preferred a crossbody because I didn't have to worry about holding it the whole day. Also I recommend heading over to Aria and grabbing a fresh juice from Pressed Juicery if you're going to be partying at night! A great way to gear your body up for a fun night out! Now what would Vegas be in the summer without the pool parties?! You have to make sure you have a hot swimsuit whether you're relaxing by the pool or have a blast at one of the many pool parties at the hotels! If you're looking where to find the best one you can find it on the Vegas.com Pool Parties page! My necessities for a great night out are to make sure you have some extra cash whether its for taxis or gambling (the much preferred choice ;) it's needed! If you're a total foodie like me the OpenTable app was a must have! You can make reservations at pretty much anywhere! Lastly to make sure I can have a great day the next day some pre-party Advil was definitely in my bag! Now if you're an adventurist there is also an incredible amount to do in and surrounding Nevada! If you checked out my Vegas Travel Diary then you know we made the trip to Zion - which I HIGHLY reccomend! Right outside of Vegas though there is The Valley of FIre & Red Rock - which are great options if you want to stay close. If you're hiking you want to make sure you have some warm clothes - a jacket and some cargo pants are great to layer over lighter pieces just to make sure you're warm enough. Like I said above I also brought my hiking shoes to obviously hike in but they're a great option for walking around too! Make sure if you're hiking - especially if at Zion - you have legit shoes with stability, you'll thank yourself later! Lastly I always have guide book of some sort to understand any trails or attractions on the hikes. And this last one is super important for the whole trip - a portable phone charger just to make sure you're good all day! 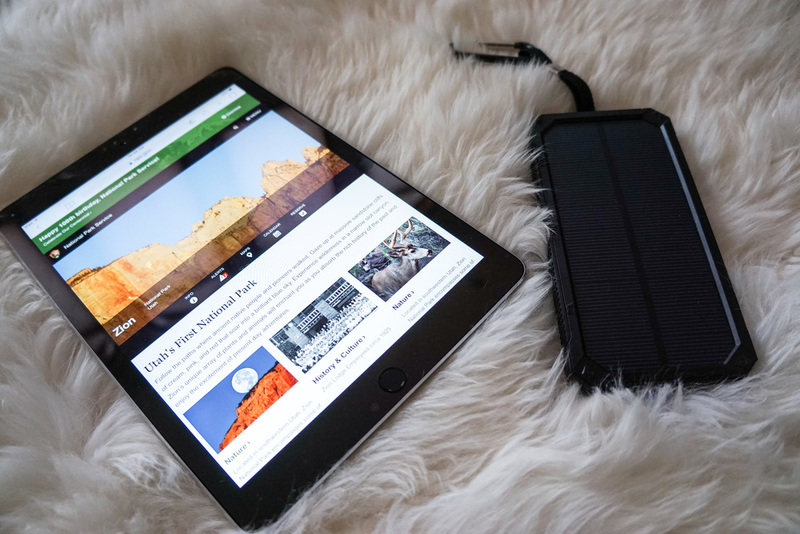 I love that this one can fit in my bag too and it's solar powered. That's it you guys! That's all you will need in your bag for an awesome trip to Vegas! Now go book your trip and have a killer time!